Broccoli Cheese Soup -- Pureed! They loved it! I loved it! We danced! We hugged! We ate veggies! :-) I put it right up there with hiding spinach in fruit smoothies and pureed carrots in tomato pasta sauces. Melt butter in heavy medium pot over medium-high heat. Whisk in flour to make roux. Add garlic and sauté about 2 minutes. Add stock, potato and all seasonings; bring to boil. Lower heat, simmer uncovered until potato is fork tender. Add broccoli and spinach, heat for 2 minutes. Stir in cream. Gradually add cheeses until melted. Preheat broiler. Place 6 oven proof soup bowls on baking sheet. Divide soup among bowls. Sprinkle 1/3 cup cheese over each. Broil until cheese melts and bubbles around edges, about 4 minutes. 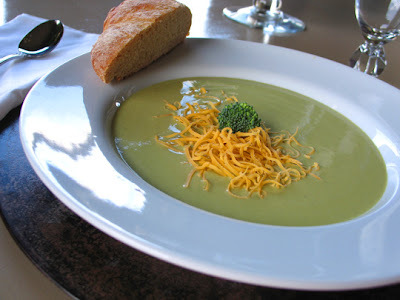 This is the Epicurious recipe I made my Broccoli Cheese Soup variation from. The sharp cheddar adds a lot of flavor. Since I have onionophobia, I always add extra garlic & other seasonings. Seems like you could hardly go wrong if you're pureeing it. We have a Vita-Mix so there was not a single trace of broccoli visible to tip off the kiddos! :-) Yummm ... tasted great for leftovers! Visit www.lifeasMOM.com for the Ultimate Recipe Swap of great veggie recipes. An inspired idea, for sure. I will be printing your recipe and use it to fill bread bowls the next time I bake some! I almost wish I ran across this recipe yesterday but the clam chowder that I made was really good. Oh, that sounds so good! You might like the cookbook "Deceptively Delicious" for your kids. It has some yummy recipes in it with hidden veggies! Thanks for stopping in at my blog! It's all about how to choose a correct partner who utilizes your money in a right way - that is incorporate it in real business, and shares the income with me. I will start following you! Happy SITS Saturday Sharefest!! Thanks for stopping by my blog and also for sharing this recipe and tip. 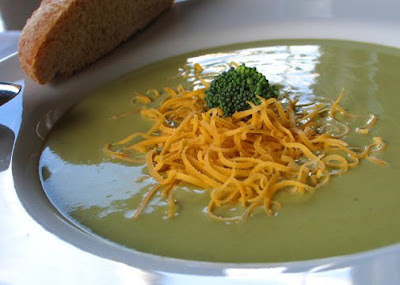 We love broccoli soup but my youngest kids won't eat it-I'll have to try this! This is a superior article as they all are. I have been wondering about this looking for some culture now. Its vast to receive this info. You are objective and balanced. I'm impressed the kids got into it! Hard to figure what kids are going to eat. I made some broccoli cheese soup the other night and it turned out ALL wrong. I will have to try it again and puree it this time! That soup looks really yummy, and not to mention very easy to make! Thanks for sharing your changes, I can't wait to try this one out!! !